Wow! It's January 2013! So weird getting used to that. Anyway, I am back, having successfully survived the holidays. (There were a couple questionable points there but alas...) Which means we shall be attempting to blog more often. I made that one of my New Year's Resolutions. Hehe. Well clearly I'm not off to a good start. To begin we have more pictures of the Colonial Dress. It has since been finished, I just don't have finished pictures. Since these were taken, the trim has been stitched down and hooks/eyes have been added to the center front, I find I dislike pins for closure. 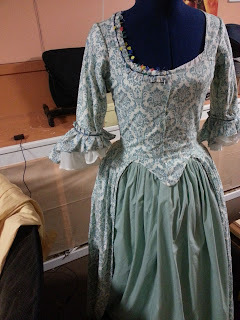 Larger picture of the dress, Showing the sleeve and the other petticoat. Full shot of the dress. Sleeve Ruffle Thingy. 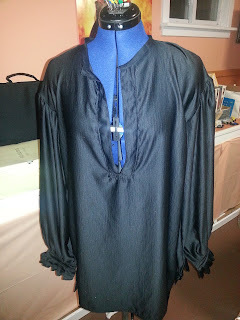 Double layered, pleated to the sleeve with the same ribbon as the neckline. 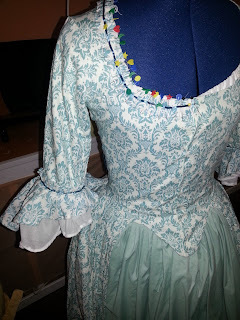 Now with a completed dress, with hems and closures (big deal for me), there is one less thing to do on the list. And I can take pictures with the cat! 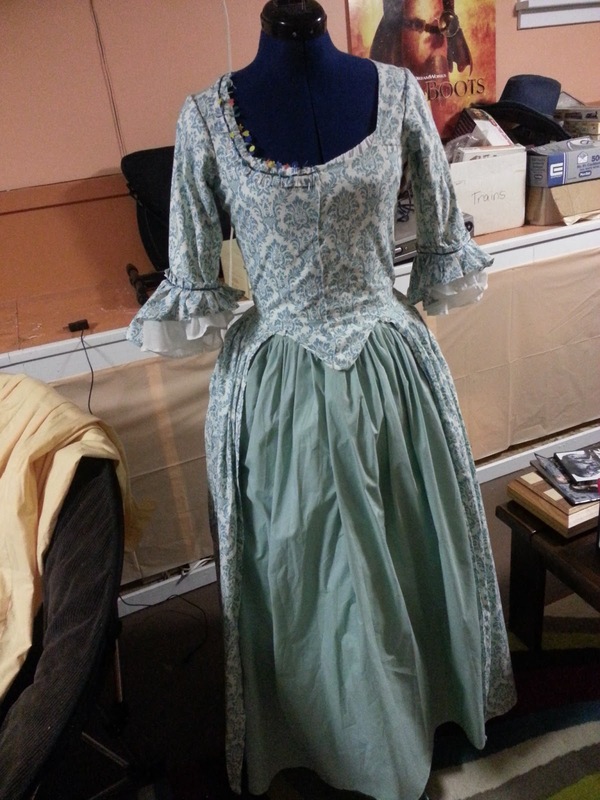 (Once cap and neck kerchief are finished). Although that kind of back-fired because in trying on this dress, I learned I need new stays.....doesn't that always happen? Anyways! 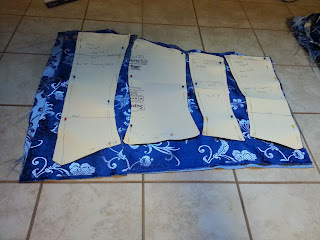 In an effort to accomplish many things, and not be sewing right before upcoming events, things have been started early. And those things that have been started early are Top Secret Projects, yes with capital letters. I can show you some pictures but cannot tell you what they are. 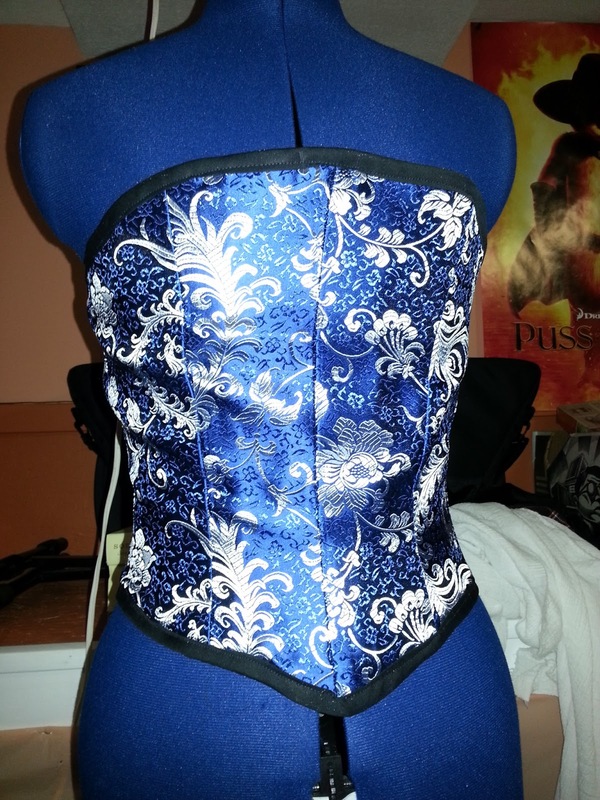 This is my corset, I have since fixed the binding on it so the fashion fabric lays flat. The corset is four layers; lining, interlining, interlining, fashion fabric. 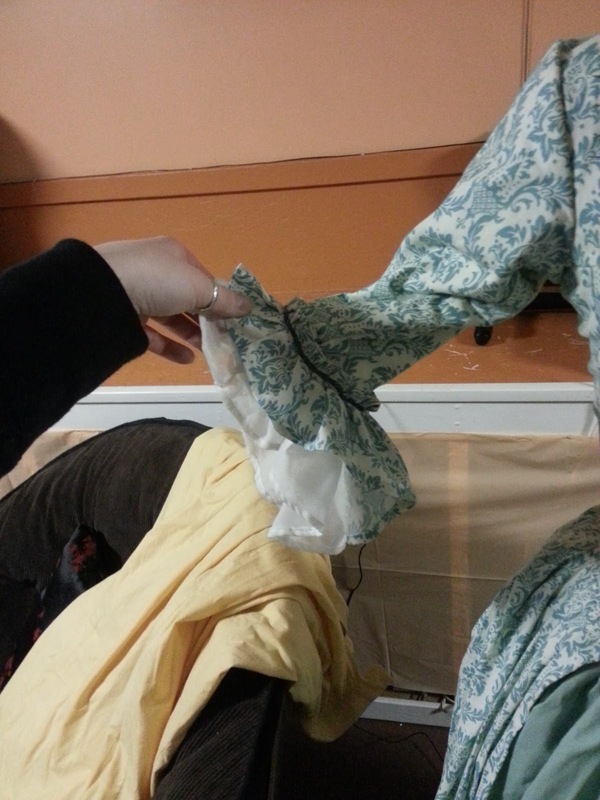 The "boning" is 1/2'' cable ties sandwiched in the interlining layers. I used my corset block pattern, same as I did for my Marian costume, just the full length version. 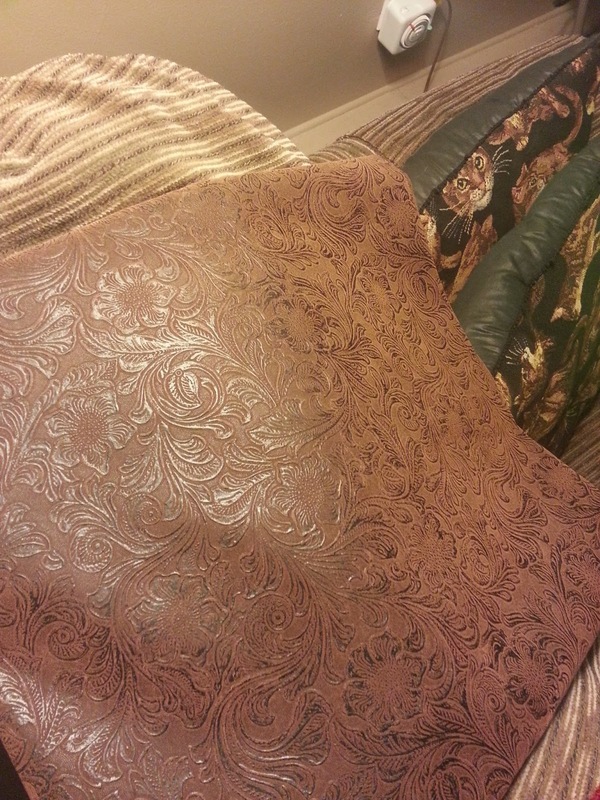 This last picture is this gorgeous tooled faux leather. I found it on Ebay and it will be a key part of my costume. Soon. Lastly we have the first part of lover's Top Secret Project costume. 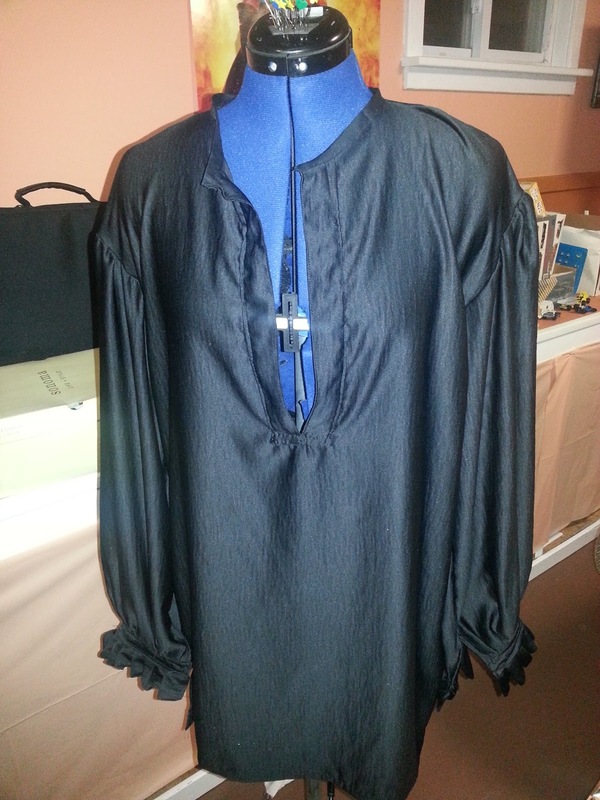 It still requires buttons, and its proper collar. 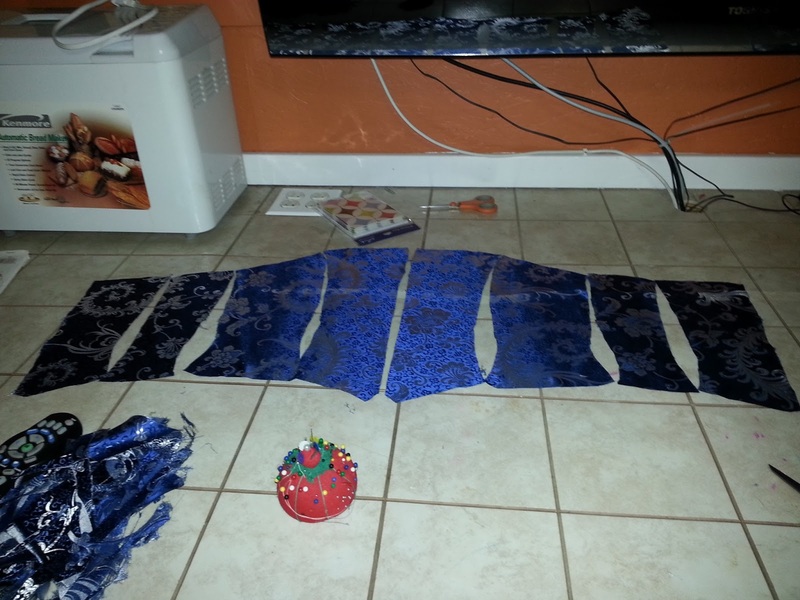 The fabric was horrid to stitch. Feel free to guess. I ain't saying a word!